Although the terms are often used interchangeably throughout the laminating industry, there is actually a difference between a laminating sheet and a laminating pouch. Simply put, a "laminating sheet" is a single piece of laminate film; it is not sealed or attached to a second sheet. A laminating sheet is used for single-sided laminating. They are most often self-stick, meaning they do not need any heat or machine to laminate your page. Instead, they just use pressure. It will have a paper liner covering the adhesive that you would peel off to stick to your page. Laminating sheets are perfect for certificates, fliers, signs, schedules, and more. The sizes available are typically a bit limited, but they can always be trimmed down to size. 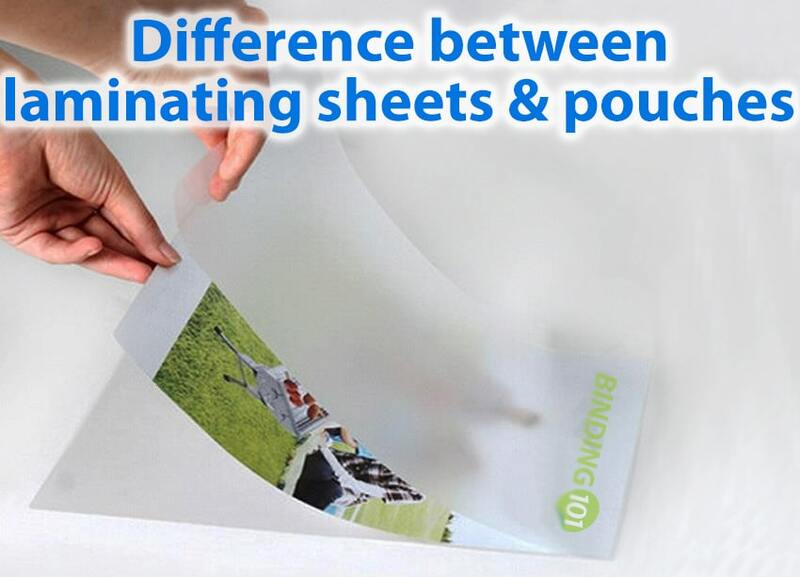 They offer a bit more stability to your pages over plain sheets, without the complete protection from spills and bends that you would get from a fully encapsulated laminating pouch. Tip: Peel off just the corner of your line and crease it back to expose a small amount of adhesive. Sometimes the liner has a grid; use that to line up your page properly to the pouch, then press down the page to the exposed corner. Slowly peel off the liner while pressing your page onto the laminate sheet, smoothing it from the corner, toward the edges. You can do it by hand, or use a small roller. A "laminating pouch", however, is a piece of laminate film that has a pre-sealed edge on one side, connecting it to another piece of laminate, creating a pouch or pocket. A laminating pouch is used for two-sided laminating, and comes in either cold pouches or thermal pouches. The cold ones can be made by hand without a machine, or can be used with any laminator that has a cold setting. Thermal pouches always require a heated pouch laminator to seal. Laminating pouches are perfect for all-around protection for documents like photos, multi-use documents, ID cards, and more. Since they encapsulate the page completely, both the front and back sides of your page will be protected. They also double the stability and rigidity of the document, making them even more durable and resistant to bends and tears. TIP: If your pouch comes out wavy, your laminator is too hot. If it comes out milky, it is too cold. Adjust the heat or speed settings accordingly. If there are not heat or speed adjustments, you can use or omit a laminating pouch carrier to either protect your pouch from excessive heat, or allow more heat to reach it. Do you use laminating sheets or laminating pouches? Email me at mallorym@buy101.com with some photos of how you use them for your business or school for a chance to be featured in our blog!